Spinata Grande - Go Mexican at Winnings.com! Get ready for something completely different at Winnings.com… and it has nothing to do with Monty Python I can assure you. Whether you feel like going to a Mexican eatery or not, you will love the latest addition to the already amazing portfolio of online slots at Winnings. Let’s open the curtain and welcome Spiñata Grande! This amazingly different online slot from NetEnt features 5-reels, 4-rows deep and 40-paylines. Nothing spectacular at first you might think, but there’s simply more to it. Spiñata Grande includes a Mini-Slot feature, special Wild symbols and of course free-spin bonus rounds, too. The symbols are vibrant and depict various fun aspects of a typical Mexican fiesta, enriched with spicy winning opportunities one might say. The Net Entertainment powered video slot is as entertaining as it is rewarding, because of the simple fact(s) that it is a Mexican party with a twist. Listen to the folksy Mexican background music while reels with symbols such as candy, confetti and piñatas create winning combinations and incredible payouts. Wagering starts from just 20p per spin with a maximum of £200 with all paylines and maximum bet enabled. The special features of this entertaining online slot are the so called Colossal symbols, Mini-Slot feature I’ve already mentioned, as well as the special Colossal Wild symbols and Free-Spins. In fact, all available symbols actually can show up as Colossal symbol in a two-by-two or three-by-three section on the reels. With a bit of luck and the Colossal symbol appearing on the reels the Mini-Slots feature will be triggered. How many Mini-Slots symbol, 3, 6 or 9, might appear depends on the amount of the Colossal symbols. During the game Scatter and Extra-Spin symbols can appear, rewarding the player with free spin rounds. Those symbols are represented by three different coin symbols anywhere in the Mini-Slot. With just three Free-Spin symbols five free spins (surprise?!) will be triggered. Every extra symbol triggers an additional free spin. 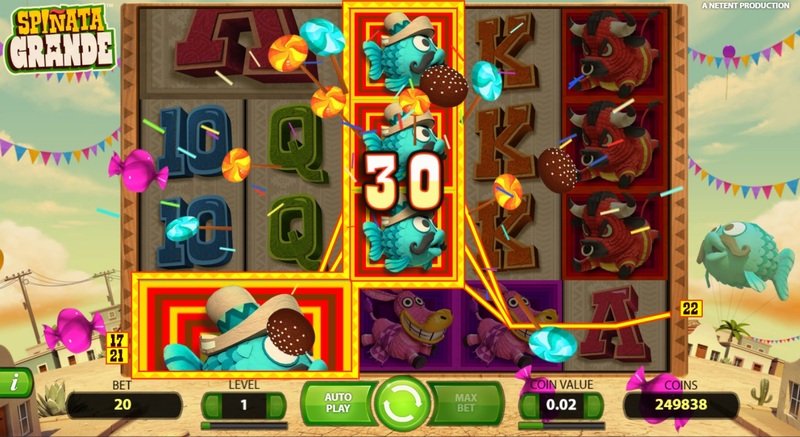 The features and concept mentioned above, especially the 3×3 reel-symbol block called the Colossal Wild, was already used in another amazing video slot called ‘King Colossus’. While preparing the blog post I managed to get a bunch of free-spins with the special Colossal Wild feature being triggered three times; which in return let to some whopping (theoretical) winnings of 312-times the original wager. Yes, I played it in the demo mode, which is available for all games in the portfolio of Winnings.com by the way. Personally I found Spiñata Grande to be one of the more entertaining ones with ample winnings opportunities and hours of entertainment. Granted, there are others that feature more than just a few bonus and free-spin symbols and extra-spins with multipliers. The Colossal Wild feature does however show up and can be triggered. Amazingly refreshing and in return quite rewarding is the Mini-Slot feature. Together with the Colossal Wild feature it actually provides some lucrative winning opportunities. Before you get too excited let me provide you with some important information about all games in general at Winnings. Once registered, you can play all available games, including various online slot machines without any risk in the so called demo- or free-play mode. Take your time in getting used to all the features before you play (and win!) with real money. Make sure to take advantage of Winnings’ special bonus offers when you sign up. Always stick to a budget and play some other games, such as the refreshing and rewarding online scratch cards and more. Remember, always play safe, reasonable and enjoy hours of fun during your stay at one of the best destinations for all kinds of online games – Winnings.com.